Trustees of the charity set up to deliver a tree-covered bridge across the Thames in London have warned that the project is not a going concern and could substantially exceed the estimated costs. The Garden Bridge Trust’s annual accounts, filed with Companies House this week, show that it needs to plug a £56m shortfall in the amount it has raised towards the estimated £185m cost of the project. But a warning in the accounts from Lord Mervyn Davies, chair of the trust, says the cost could be even higher because of a number of hurdles and delays that need to be dealt with. For example, he says, the charity is as yet unable to secure the land needed to build the bridge on both sides of the river. Davies also blames the delays on the change of London mayor, the EU referendum and the subsequent change of government, judicial reviews of local authority decisions relating to the project and protracted negotiations with third parties. "Due to material uncertainties in existence ahead of finalising these accounts, trustees are unable to conclude that the trust is a going concern and feel it only appropriate to flag these risks," Davies writes. "It is hoped that these will be resolved over the months ahead but, since a number of these risks are outside of the control of the trustees, they recognised that if this is not possible they will need to consider the further delay to the project and, in a worst-case scenario, whether the project remains viable." The accounts say the trust has received £129m of financial commitments. Sixty-million pounds is from the Department for Transport and Transport for London, including a £20m loan to be repaid to TfL. The rest of the money has been pledged by charitable trusts and other philanthropic institutions, private companies, individuals and the wider community. The accounts say the biggest causes of uncertainty for the project are securing the land, whether the new Mayor of London, Sadiq Khan, will honour his predecessor’s guarantee to support the maintenance of the bridge once it is in place and the need to secure funding that will not need to be repaid if the project is unable to go ahead in the first half of this year. According to the accounts, the funding needs to be secured to allow the trust to sign a contract with the construction companies in time for building to be begin before the planning consent for the bridge runs out at the end of this year. Despite the uncertainty, Davies concludes his introduction to the accounts by saying that "given the success we have had so far, we are confident we will meet our funding targets". 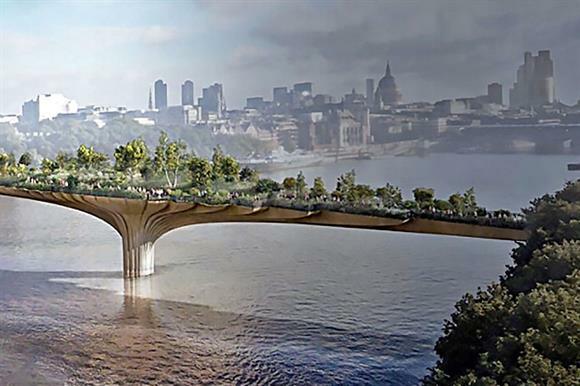 He says: "We look forward to starting construction in 2017 and making the Garden Bridge happen." Khan has previously warned that if the project does not go ahead an estimated £40m of public funding that has already been spent would be lost. He has said that no more taxpayer money would be provided to fund it. In September he ordered a review, led by the Labour MP Dame Margaret Hodge, of whether the project had so far provided value for money and criticised the lack of transparency around the project. After BeatBullying, is more guidance needed on being a 'going concern'?